The Santa Fe Center for Transformational School Leadership is proud to announce an amazing three-year partnership with Ferguson-Florissant School District, located in a suburb of St. Louis city, and the Institute for School Partnership at Washington University. You may recognize one of the cities served by the school district—Ferguson—the scene of well-publicized racial violence and distrust last year. Ferguson’s superintendent, Dr. Joe Davis, a Harvard-trained educator, was actually attracted to the challenges of the district when he saw the superintendency was open last year. His passion for high quality education for all students has ignited the community’s commitment to the school, and he is assembling a powerful team to support the transformative agenda upon which the school has embarked. Victoria May and her staff of the Institute for School Partnership at Washington University (ISP) will bring their rich experiences in high quality curriculum and instruction to the mix. The goal of the ISP is to design and model strategic partnerships between K-12 schools and higher education that are focused on improving students’ development and success. 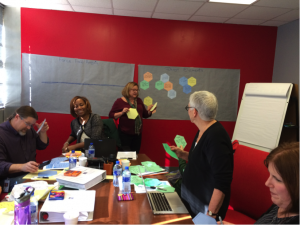 Victoria immediately saw the Ferguson-Florissant partnership as an ideal fit for her organization, and joined members from the school district and the Santa Fe Center to outline an intense agenda spanning the next three years. We at the Center feel privileged to be a part of this dynamic team. Our focus this first year of the project is to build leadership capacity at all seventeen elementary schools in Ferguson-Florissant. The board members of the district stand firmly behind the initiative and supported the superintendent by adding seven new assistant principals in elementary schools and agreeing to restructure elementary instructional coaching positions into more powerful teacher-leadership roles. The work this year, in part, grows from the research described in the Bain Report, a provocative proposal for distributed leadership in schools. As described in the report, “Breakthrough results in student achievement occur when the significant challenges our students face are met with an even greater level of teacher talent and dedication—when talented individuals work together to do extraordinary things.” The Ferguson-Florissant Transformation Project begins with a firm commitment to the power of teacher voices to inform and transform the education of the community’s children. The Project’s kick-off begins the first two weeks of June with a leadership institute for 130 teachers and administrators. Throughout the 2016-17 school year, coaching, book studies, university courses offered through Washington University, action research, retreats, and other professional development experiences will support the teacher and administrative leaders in developing their skills and understandings as transforming leaders. The Transformation project will include a full-time researcher who will be implementing a design-based implementation research approach to our work that creates a partnership with the project implementers much different from traditional research. Wang and Hannafin (2005) capture DBIR’s critical characteristics: a systematic but flexible methodology aimed to improve educational practices through iterative analysis, design, development, and implementation, based on collaboration among researchers and practitioners in real-world settings. We are excited about working with this collaborative approach to research and design. Additionally the project is hiring a program evaluator to help us track the project’s progress. This project is funded through a private foundation interested in transformational work in urban settings. We are honored the foundation selected our proposal, and we are committed to full participation in this important initiative that we believe will serve as a lighthouse for school transformation nationally.